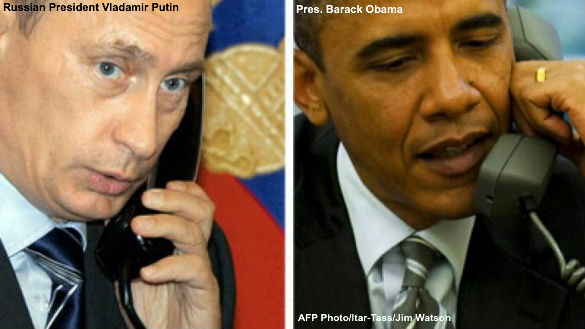 Obama: Oh, hey Vlad. I didn’t want to bother you so thanks for calling. Between the Olympics and taking over Ukraine I know you’ve been extremely busy. Putin: Thank you for understanding. Yes, between handing out gold and going for the gold, it can make for hectic days. I just really appreciate the fact that I can count on you . W would have made my life much more difficult and his Dad, forget about it. Ukraine would have to be a pipe dream. Obama: Well, it’s kind of hard to take credit for remaining true to one’s nature. I guess that is a trait we both have in common. Actually, I should be thanking you. My supporters and the American media love that fact that I’m remaining passive in the face of your belligerence. The more you do and the less I do is actually good for my poll numbers. And it makes McCain look like a war monger. Putin: Yeah, that John is such a little hot head. I roll tanks and he wants to see heads roll. Obama: Not to change the subject, have you talked to Bashar lately? Putin: That is one of the reasons for my call. He wanted me to thank you for not sending in cruise missiles as you once promised. Obama: He really doesn’t have to thank me. Frankly, it was my mistake in the first place to draw a red line I was never really prepared to deal with. Listen, Bashar has his nature too and I should have been more sensitive to the fact that the apple doesn't fall far from the tree. Putin: Speaking of apples, I loved the box of golden delicious apples you airmailed me. In Moscow in the winter, even with my $100 billion in the bank, a fresh piece of fruit is always a welcomed treat. Obama: I should send you the White House chef’s cobbler recipe, it is delicious. Putin: That would be awesome. I love a good cobbler. Obama: Hey, I’m at my desk so I’ll email it to you right now. Putin: I’ll have my chef make it tonight and I’ll let you know what I think. Hey, I know you have mid term elections coming up. Before your re-election, you talked about having more flexibility with Med and me. Boy, were you ever right. That boy scout Romney might be giving me some unappreciated resistance right now. Obama: You never had anything to worry about with Romney. America is an amazing place, the economy could be in shambles, Obamacare can be a mess and all I have to do is say boo about women's rights. Putin: In Russia, all I have to do is say boo and I’m reelected. Obama: Do you even have elections? Putin: Truth be told, not really. But pretending like we do makes things a little smoother. Obama: I wish we were more like you.